​A single ticket will be drawn from all the tickets sold that night and the number will be announced. The number will be called 3 times, the winning ticket holder will have five (5) minutes to present themselves and present the winning ticket to the caller before another ticket is drawn. This process will continue until a winning ticket holder comes forward. Each Week, 40% of ticket sales will be added to the Grand Prize Jackpot unless the Grand Prize is won. If the card selected isn't the Ace of Spade, the winning ticket holder (Participant) will receive 10% of that night's sales as a consolation prize and the jackpot will carry over to the next week's draw. ​The participant will win the accumulated Grand Prize Jackpot, including the 40% of that night's sales. The participant does not win the 10% consolation prize. ​Note: this isn't the complete set of rules for the Chase the Ace event. To view a copy of the complete set, please ask the ticket sales attendant the night of the event. The moment you have all been waiting for is here!!!! 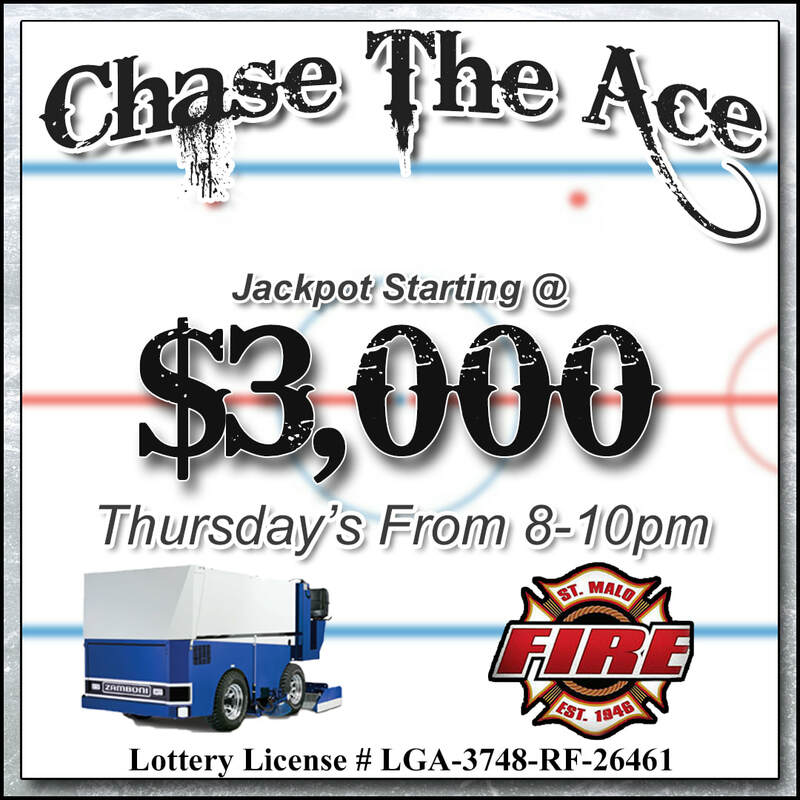 Thursday September 6th, 2018, Chase the Ace is back baby!!!! We’ve made a few changes...it will now be on Thursday’s from 8-10pm with draw at 10:15pm at the St. Malo Hôtel and the biggest is that our starting Jackpot is now $3,000...Yup you saw that correctly! We are looking forward to seeing you all again and can’t wait to see the day one of you wins that big jackpot, just hopefully not too soon !